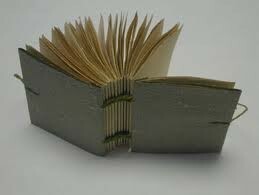 Bookbinding is the process of making a book from a number of folded or unfolded sheets of paper or other material. It usually involves attaching a book cover to the resulting text-block. Before the computer age, the bookbinding trade involved two divisions. 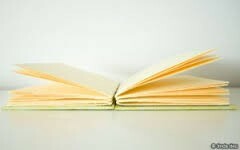 First, there is stationary or vellum binding which deals with making new books intended to be written into, such as accounting ledgers, business journals, and guest log books, along with other general office stationery such as note books, manifold books, portfolios, and etc. Choose your paper. To create your own book, you can choose to use any paper you would like. 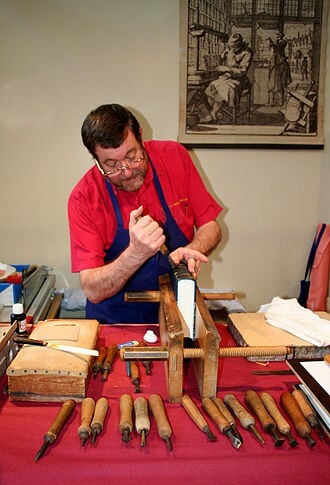 Regular 8½ x 11 printer paper can be used, as can any variety of handmade papers or card stock. Make sure that you have enough pages prepared to fill your whole book, around 50-100 sheets. You will be folding each sheet in half, so your total number of pages will be double the number of sheets you use. Create your signatures. A signature is a grouping of pages that are folded together. Each signature should consist of 5-8 sheets of paper folded directly down the center together. Use a bone folder for the cleanest crease and a ruler to make sure you have the fold centered down the direct middle of the signature. Your book will contain several signatures, so make as many as are necessary to use all your paper. Gather your signatures. Pick up all your signatures together, and tap them into place against a hard, smooth surface so that they are level. Make sure that all the pages are lined up and even along the spine; your signatures should all be facing the same direction. Lastly you can sew the signatures make sure to make holes for the string to go in.